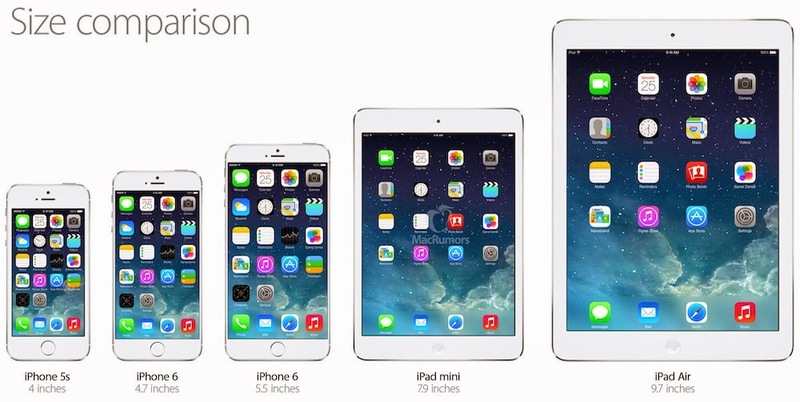 iPhone, iPad, Mac & Me: To 4.7" or 5.5"? The rumors on the new iPhone 6 are pointing to two new sizes this fall. The iPhone 5/5s saw the screen size increase from 3.5" to 4". The new screen sizes are supposedly 4.7" and 5.5". With my disdain for extremely large phones (e.g. Galaxy Note, Mega), at one point I was dead set on getting a 4.7" iPhone. But, the rumors have me really thinking about getting the 5.5" version. Optical image stabilization for 5.5" iPhone only: KGI Securities says the 5.5" iPhone is likely to have optical image stabilization while the 4.7" iPhone may not. Optical image stabilization is what gives point-and-shoot cameras the ability to shoot clear photos even if your hand is not completely still. Since I'm really into iPhone photography, this is a big deal for me. 5.5" iPhone could have better battery life than the 4.7": Photos of a 2,915 mAh battery for the 5.5" iPhone has surfaced. Compare this with a possible 1,810-2,100 mAh battery for the 4.7" iPhone. Both batteries are an improvement from the iPhone 5s 1,560 mAh battery and the iPhone 5 1,440 mAh battery. For me, battery life and picture quality are high on my lists of wants for the new iPhone. If I have to buy the insanely larger iPhone, then I'll do it to get those feature. I hope Apple takes advantage of the larger screen real estate to create a new class of apps that'll work with special features on the 5.5" iPhone, not unlike the iPad-only apps.